5 Points Northshore is photographed Thursday, April 4, 2019 in Chattanooga, Tennessee. The high-end apartment complex opened in what was formerly the site of Loft restaurant. The biggest new apartment building to go up yet on Chattanooga's busy North Shore has opened, with its operator citing the "cool options" in the 190-unit complex. 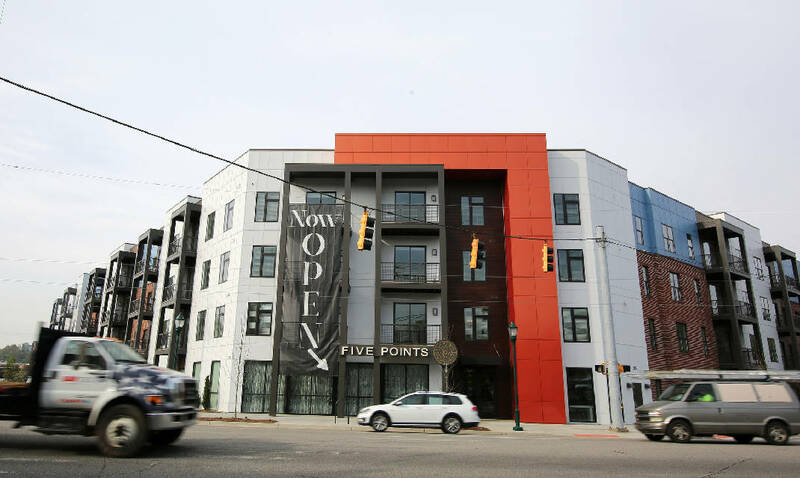 Free garage parking is one of those amenities at 5 Points Northshore, said Allan Ragsdale, community manager at the four-story building at Cherokee Boulevard and Manning Street. The 5 Points Northshore apartment complex on Chattanooga’s North Shore was built on the site of the former Loft restaurant. But if residents want to leave their cars parked, there are 101 eating establishments within about a quarter-mile from the $37 million complex, he said, adding that he personally counted the eateries — twice. "It's the most livable part of downtown," Ragsdale said about the North Shore. "The Southside is fun, but there are no stores." The complex, raised by Bristol Development of Franklin, Tennessee, is the latest apartment building to go up downtown, and about 1,000 more rental units are under construction or planned in the central city. A recent city report on the leasing success of some of the new apartment complexes shows a mixed bag. Ragsdale said he expects it will take a year to fill up 5 Points Northshore, though leasing could go faster. "It can be a challenge. There's a lot of inventory," he said, adding that some apartment complexes have started discounting leases. Rents for the one- and two-bedroom units at 5 Points go from $1,464 to $2,250 monthly, though some apartments start at $1,199 under a special promotion, Ragsdale said. Also, the first month can be free with a 12-month lease, he said. Restaurateur Steve Flynn, who plans to open a new eatery across Cherokee Boulevard from 5 Points Northshore later this month known as Stevarino's, said that all the new housing going up is one of the reasons he likes the location. "There's a lot of community and more family-oriented residents," he said. "We like locals. We like to get to know people's names." Ragsdale, who works for the Bell Partners management firm, cited the apartment building's proximity to Coolidge Park and the walking trails on Stringer's Ridge among the outdoor opportunities near 5 Points Northshore, which was built on the site of the former Loft restaurant. The new apartment complex includes such amenities as a heated, salt-water pool, a large common area, and a sizable fitness facility. Kim White, who heads the downtown nonprofit redevelopment group River City Co., said a lot of apartments opened downtown about the same time and it's a matter of the market absorbing the units. "What we're excited about is that there are options," she said. White said plans are to conduct a market study toward the end of this year. Also, another tour of downtown living effort to show off properties is expected to be held in the spring, she said. White said developers are still interested in building housing downtown. "That pipeline is not empty," she said.